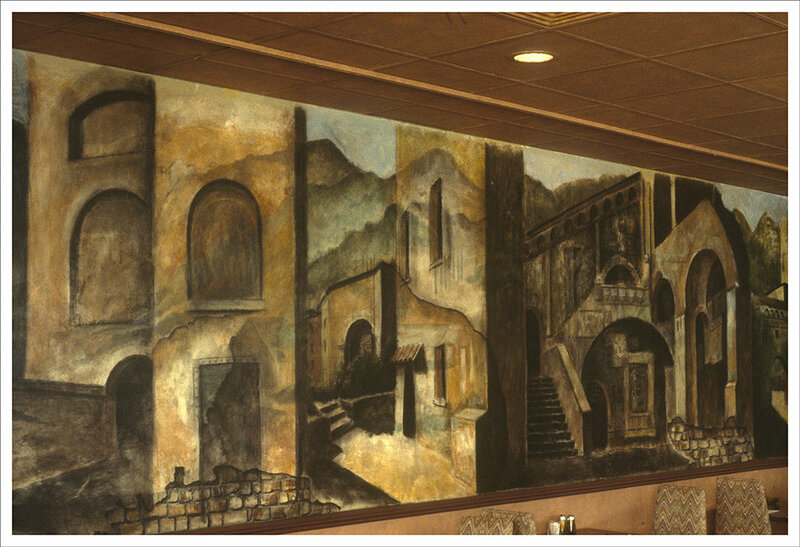 In 1988 Aidron Duckworth was commissioned by Bill Deckelbaum to paint a mural inside Bartelli's Restaurant on Route 120 in Lebanon, NH, the site of the former long-time Lander's Restaurant and currently the site of the Days Inn. At an impressive 30 feet long and 6 feet in height, this mural depicted scenes from Italy int he major dining area of the restuarant. Artists Barbara Kaufman and Gertrude Mertens, students and friends of Duckworth, organized a reception at Bartelli's with 200 guests to celebrate Duckworth's 30 years of work as a sculptor and painter in 1990. Unfortunately, in 1995 Bartelli's was demolished to make room for a new motel. Bartelli Murals Remembered is an exhibition that gives us a chance to revisit a place that is now only in our memory and records. This exhibition brings together works from the Duckworth Museum’s collection with a selection of poetry on the themes of wellness, illness, and self-care. Nathaniel Rosenthalis, a Senior Fellow in Poetry at Washington University in St. Louis, where he received his M.F.A. in 2016, chose the poetry for this show. I’m the Senior Fellow in Poetry at Washington University for the 2016-17 year. I received my M.F.A. from Wash U and my B.A. from Sarah Lawrence. Before moving to St. Louis for graduate school, I worked in editorial at Oxford University Press in New York. I was born and raised in Wilmington, Delaware. Duckworth, throughout his life, continued to be drawn to the exploration of the human condition. For Duckworth, the act of painting was itself a way to heal, a form of self-care. Poets included in this exhibition: John Ashbery, Mary Jo Bang, Tory Dent, Timothy Donnelly, Vievee Francis, Aracelis Girmay, Francine J. Harris, Lyn Hejinian, Bernadette Mayer, Thylias Moss, Claudia Rankine, Nathaniel Rosenthalis.